TRG has adopted the "QTEQ Taper Clamp Left Hub for Tamiya F103/F104" to their new product "TRG111 KIT" as a standard component. And also, TRG and QTEQ have started cooperation in research and development of 1/10 DD CAR MODEL VEHICLE DYNAMICS. 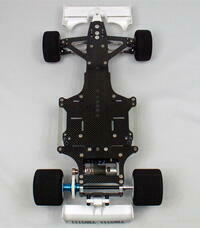 we will pursue the "HOBBY PERFORMANCE" which would make RC CAR fans happier.